Barnes & Noble introduced Nook for Web, a browser-based ebook platform meant to compete directly with Kindle's Cloud Reader, Apple's iBooks, and Kobo's Instant Reader. The Nook for Web app allows users to access the Nook digital bookstore and their personal libraries of ebooks from any web browser - at least, that's the idea. But Nook for Web doesn't work on Apple's iPhone or iPad, two devices that could sorely use it. Users of Barnes & Noble's Nook and Amazon's Kindle services have been frustrated by Apple policies in the past. Apple dictates that ereader apps can't link to a digital bookstore other than Apple's, so users are unable to purchase books from within the Nook and Kindle apps. But last year Amazon launched the Kindle Cloud Reader web app in part to bypass that policy, allowing Kindle customers to access the digital storefront from an iPhone or iPad's Safari web browser. Nook for Web seems meant to accomplish the same workaround, but there's a glaring problem: it doesn't work in the iPhone and iPad's browsers. 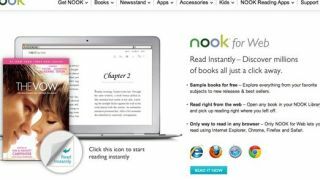 Attempting to access Nook for Web from an Apple devices produces a message prompting users to access the store from a desktop version of Internet Explorer, Chrome, Safari, or Firefox. But Barnes & Noble's own information hub for Nook for Web claims that it works "in any browser." A Barnes & Noble spokesperson responded to TechRadar's inquiries to note that "support for Internet-enabled tablets, smartphones and other mobile devices is coming this fall," and that "this will include Apple devices." Regardless, signing up for Nook for Web now gives you the option to download a predetermined set of six books for free before July 26, and the service does seem to work in most browsers.